You must sign in using your ASBPE.org username and password to receive exclusive Members-Only Pricing. Non-Members: Please click here to create a Non-Member account. Need help signing in with your ASBPE account? Click here to reset your password. This will be the only extension! Contact Jessi Marie McCarthy, ASBPE Coordinator, at (727) 553-4214 or info@asbpe.org. 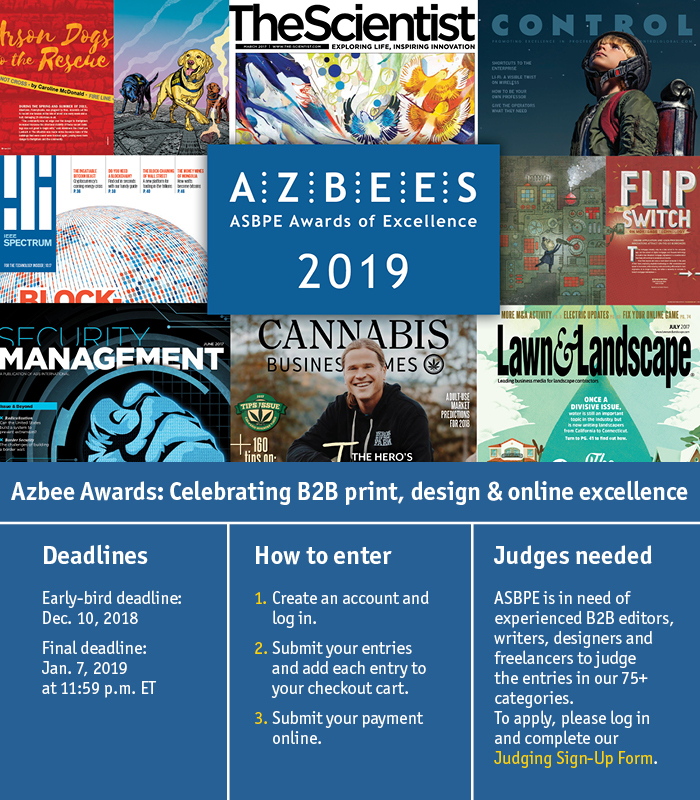 The 2019 Azbee Awards contest is now closed for entry. Finalists will be announced mid-March. Please save the date for the 2019 ASBPE National Conference and Azbee Awards Banquet, May 9-10, at The Poynter Institute in St. Petersburg, Florida.